Notes: Denominator: within each category, all employees in establishments. State expanded Medicaid coverage during the period 2010 through 2015. 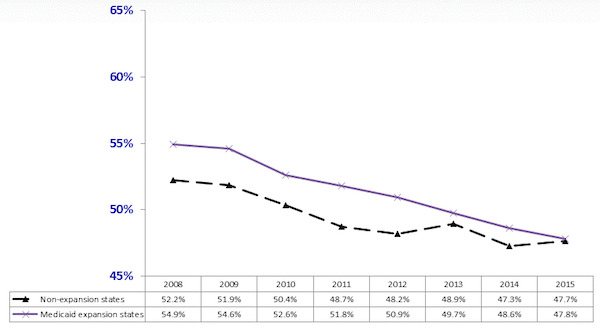 Data Source: Center for Financing, Access, and Cost Trends, AHRQ, Medical Expenditure Panel Survey Insurance Component, private-sector establishments, 2008–2015. This entry was posted in Data Watch on February 22, 2017 by Genevra Pittman.